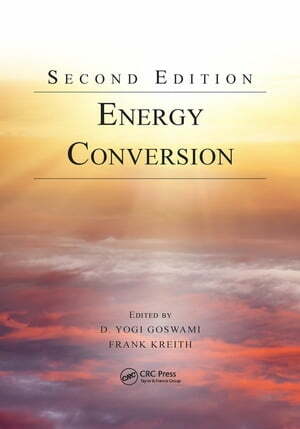 Collins Booksellers - Energy Conversion by D. Yogi Goswami & Frank Kreith, 9781315356624. Buy this book online. This handbook surveys the range of methods and fuel types used in generating energy for industry, transportation, and heating and cooling of buildings. Solar, wind, biomass, nuclear, geothermal, ocean and fossil fuels are discussed and compared, and the thermodynamics of energy conversion is explained. Appendices are provided with fully updated data. Thoroughly revised, this second edition surveys the latest advances in energy conversion from a wide variety of currently available energy sources. It describes energy sources such as fossil fuels, biomass (including refuse-derived biomass fuels), nuclear, solar radiation, wind, geothermal, and ocean, then provides the terminology and units used for each energy resource and their equivalence. It includes an overview of the steam power cycles, gas turbines, internal combustion engines, hydraulic turbines, Stirling engines, advanced fossil fuel power systems, and combined-cycle power plants. It outlines the development, current use, and future of nuclear power.